Value investing isn't for everyone. Like practically everything in life, however, you can't know for sure until you’ve tried it and seen how, where, and especially when value investing can get results. Anyone can stumble onto bargains. But knowing whether the companies behind the cheapest stocks and bonds are the genuine articles for the long run is part science and part judgment. 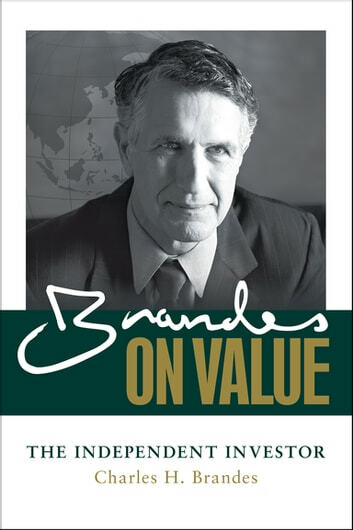 Brandes on Value is your opportunity to experience both sides of the equation. From the time-tested Graham-and-Dodd fundamentals introduced in the 1930s to the contemporary lessons of Japan's lost decades, the financial crisis of 2008-2009 and the rapid globalization of the investment arena, Brandes on Value is a modern take on a classic approach to a timeless discipline. Through real-world examples and time-tested perspectives on classic Graham-and-Dodd principles, Brandes on Value: The Independent Investor is more than just a "how to" for value investors. It also answers "how come" and "how now" in the modern investment world--one that is too often distracted by short-term thinking and short-lived trends. ON MARKET CYCLES and how boom-and-bust speculation lays the foundation for value investing opportunities that are often hidden in plain sight. ON INVESTOR PSYCHOLOGY and why behavioral biases work against the average investor and in favor of the patient, persistent value strategist. ON PRODUCT TRENDS and the trappings of old ineffective investments constantly repackaged into new ones. ON "MR. MARKET" and proof that value investing pioneer Ben Graham's bipolar parable is more vocal now than ever. ON RISK and its misperceptions that lead to costly long-term setbacks for individual and institutional investors. ON VALUE and why this investment discipline with roots in the 1930s is more relevant and needed than ever before. An Empirical Study of Price-Volume Relation: Contemporaneous Correlation and Dynamics Between Price Volatility and Trading Volume in the Hong Kong Stock Market.